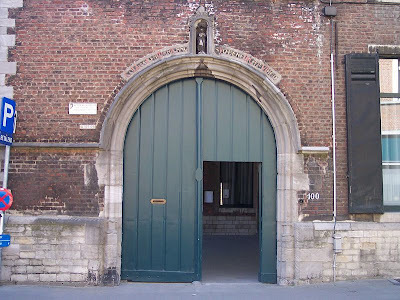 The image above now belongs to history -- after 154 years of operation, the "Green Door" of the nation's oldest overseas seminary, the American College Louvain, was shut for the last time on Sunday after a morning Mass, and the plug unceremoniously pulled on the house's website. The Belgian outpost's end decided last November by the US bishops -- who chartered the American College of the Immaculate Conception in 1857 and retained its oversight -- recent years' spiraling costs of maintaining a residence for a student body that dwindled into the range of a dozen had set the stage for the move. At the same time, Louvain has increasingly suffered in the ever-growing shadow cast by its younger sibling, the Pontifical North American College in Rome, which has come to boast a student body larger than any Stateside seminary for the first time in its 152-year history. Likewise, as previously noted, Louvain is but the first casualty of this year's intensified effort by the US bishops to pursue options for consolidating the nation's formation houses, in the hope of better reflecting a scenario where, despite the number of American seminarians falling by roughly half since these shores' post-Conciliar peak of ordinations, the country's seminary structures have largely remained untouched. Under plans sketched out at last year's November Meeting, each of the USCCB's 14 geographic regions is to agree to a plan with changes warranted by its respective local situation by the conference's next Fall Plenary in Baltimore. While each group traditionally goes on retreat together every early January, next week's Summer Meeting in Seattle will, among many other things, see the regions' first formal business since November. That said, with the conference's seven-month long ad limina visit to Rome set to begin in late Fall, smart money would posit that any seminary changes sketched up by the regions will be brought for the input of the relevant Vatican dicasteries, who've long sought to get the ball rolling on the project. All things considered, any shifts to the formation landscape won't likely hit ground until 2013 at the earliest. For now, though, as one house closes, another one opens -- August will see the launch of a pre-theologate in Washington as a formation house for the capital's 30 college seminarians. Recently announced that it'll bear the name of Blessed John Paul II, the new sem will be formally dedicated on the late pontiff's feast, 22 October.